Whether you’re producing simple audios, more involved podcasts or full-blown marketing videos, the end result will be measured to a large extent by the quality of your audio. Since producing good quality audio is a core part of my Internet business, I’m often asked to recommend microphones which can be used with a computer to record voice at the highest quality. In this article, I’ll run through a selection of the microphones that I recommend which are priced to suit every budget. Bear in mind that as with anything, the more you’re willing to invest, the better the final result is likely to be. Let’s get started then with the budget choice. 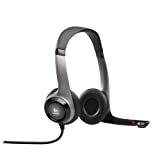 The [amazon_link id=”B000TG4AGU” target=”_blank” container=”” container_class=”” ]Logitech ClearChat Pro USB Headset[/amazon_link] produces surprisingly good quality sound for the price that you’ll pay. I’ve had one of these for a number years now and I carry it with me when I’m on business trips and don’t want to have to take my studio-quality mic. Why I Like This Mic: The compact size of this headset makes it extremely portable and the price is great for the quality that you get. I also use it extensively for Skype so it has a dual purpose for me. Definitely worth checking out! 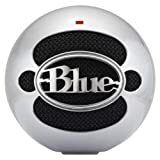 The [amazon_link id=”B002OO333Q” target=”_blank” container=”” container_class=”” ]Blue Snowball USB Microphone[/amazon_link] is a great little mic! It’s used by hundreds of podcasters around the world for it’s high-quality voice reproduction versus a very affordable price! Blue, the company behind this microphone, have a reputation for producing very high quality studio microphones and over recent years, have chosen to bring their skills to the computer audio scene. In spite of this being only a little more expensive than the Logitech headset, you’ll notice quite a jump in audio quality. Why I Like This Mic: Taking the audio quality and the price into consideration, I think this is the best value computer microphone currently available. 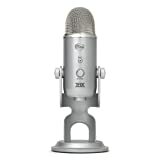 Now we come onto the daddy of all USB microphones – the [amazon_link id=”B002VA464S” target=”_blank” container=”” container_class=”” ]Blue Yeti USB Microphone[/amazon_link]. This is the microphone that I now use for all of my important audio recording, whether for my videos, podcasts, mp3’s and even for Skype. The quality is outstanding – this is the only mic (as far as I know) that has been THX certified for it’s quality and depth of sound reproduction. Why I Love This Mic: In my opinion, this mic currently represents the pinnacle of what you can buy for producing top quality audio on your computer without breaking the bank.